Based on a USD price of $7,949.00 and today's exchange rate. The Intellian s6HD is a complete all-in-one satellite TV solution that enables boaters to enjoy high-definition TV channels just like at home. The antenna’s stylish polished radome design makes it a perfect fit for boats over 45 feet. See more for less, with the s6HD. Intellian s6HD provides simultaneously reception of HDTV channels from 3 primary DIRECTV’s Ka-band and Ku-band satellites located at 99°W, 101°W and 103°W. Tune in your favorite channels on any of the 3 satellites as easy as you do at home without waiting for satellite switching. Intellian s6HD is also capable of receiving DIRRECTV local channels broadcasted through other 2 DIRECTV Ku-band satellites located 110°W and 119°W as well as Dish Network and Bell TV services. All these benefits are yours to enjoy without having to worry about a hefty price tag. Our goal is to provide an affordable, high value system so you can enjoy big- ticket broadcast entertainment and not have to worry about the price of admission. The new built in Wi-Fi ACU enables connectivity with the Aptus App that allows for simple system control and monitoring, including OneTouch Satellite library and firmware updates. Intellian s6HD system is quick and easy to install through its single cable connection from the antenna to the ACU. With an integrated Single Wire Multiswitch(SWM), the s6HD can connect up to 16 receivers as default to allow easy installation. In addition, s6HD is upgradable up to 32 receivers. With an built-in Multi-band alignment control system, Intellian s6HD is capable of keeping the multi-feed alignment toward the 3 primary DIRECTV’s satellites at sea even during harsh marine environment or high-speed cruise. 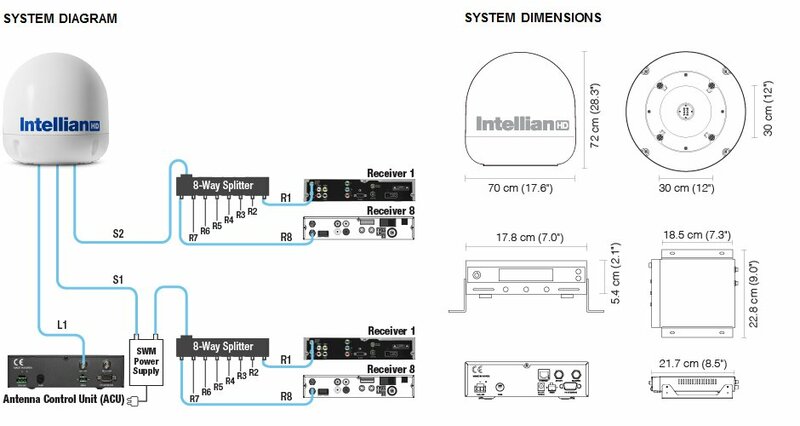 Intellian s6HD provides wide elevation range from +5° to +90° to ensure you to have seamless, uninterrupted and reliable satellite receptions throughout U.S. water.